ABUJA, NIGERIA (BosNewsLife)– Christians in northeastern Nigeria were among those facing a new wave of Islamic violence as the Boko Haram terror group killed 86 people, including children, who were heard screaming as they burned to death after militants torched huts, survivors and officials said Sunday, January 31. 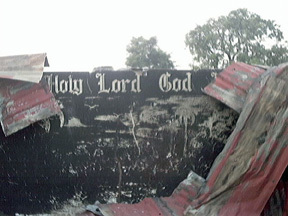 The overnight attack on Dalori village and two nearby camps housing tens of thousands of refugees came shortly after suicide attacks on two mainly Christian communities in northeast Nigeria left at least 26 persons dead and dozens of others injured, Christians said. On Friday, January 29, Boko Haram militants detonated explosives in a crowded market in Gombi, Adamawa state, killing at least eight people, according to church sources. Earlier in Chibok, Borno state, suspected Boko Haram suicide bombers attacked a crowded market on Wednesday, January 27, killing at least 17 civilians and a soldier while injuring some 30 others, Christians said. Following the government troop recovery of the town, the market had reopened that day for the first time since Boko Haram took over Chibok two years ago, according to area Christians. The violence added to concerns over the whereabouts of more than 300 Christian high school girls who were kidnapped in Chibok in April 2014. Of the girls kidnapped since the Islamic militants seized the town two years ago, 219 remain missing, Christians say. Besides the girls, suspected Islamic militants also kidnapped two Nigerian pastors this month in Kogi state, including David Onubedo of Deeper Life Bible Church who was reportedly abducted Monday, January 25, in Okene after a Bible study. In the same state in Emi-Oworo village, U.S. missionary Phyllis Sortor was kidnapped on February 23, 2015, and not released until March 6, Christians said. Onubedo’s captors are reported to have contacted his wife and the leadership of the church to demand 50 million naira (US$249,000) for his release. In Lokoja, capital of Kogi state, masked gunmen on January 10 also kidnapped pastor Ayo Raphael during a worship service of the Redeemed Christian Church of God (RCCG) Resurrection parish, Christians said. The kidnappers of the Pentecostal pastor are reportedly demanding 50 million naira (US$249,000) for his release. On Sunday, January 31, many Christians were believed to be once again among the victims targeted by Boko Haram in the latest overnight attack. Witnesses said they saw scores of charred corpses and bodies with bullet wounds in the streets following Saturday night’s violence in Dalori village and two nearby camps housing 25,000 refugees, just 5 kilometers (3 miles) from Maiduguri, the birthplace of Boko Haram and the biggest city in Nigeria’s northeast. 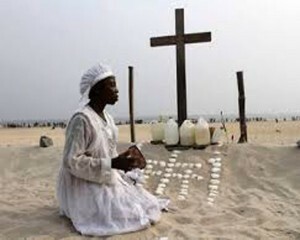 Boko Haram seeks to impose sharia or Islamic law throughout Nigeria and has ordered Christians to leave northern Nigeria. It has also continued to carry out terrorist attacks since losing territory to the Nigerian military last year. The group has inspired others, including Fulani herdsmen, who last month attacked two homes in the predominantly Christian village of Hwak Kwata-Zawan, located near the city of Jos, killing more than a dozen people, BosNewsLife learned. Christians in Nigeria have been targeted by Islamic State. They also raided a nearby compound consisting of Nigerians who had been initially displaced by violence elsewhere in the country’s Plateau state, Christians said. “The total number of fatalities resulting from the raids has reached 15, leaving many more in the community grief-stricken and emotionally wounded,” added Voice Of the Martyrs Canada (VOMC), an aid and advocacy group closely following the situation. In one of the village homes, 57-year-old Rose Monday was killed while trying to protect her three young grandchildren from the gunmen, but two later died of their injuries, Christians said. The Christian home that was attacked reportedly belonged to Gyang Christopher Choji who managed to escape the raid, uninjured. The seven other victims that were killed during the raids were from the nearby compound housing, VOMC said. at church. The militants even had the audacity to ask local children for water while planning their vicious attacks. “The resulting raids have left an entire village in a terrible state of shock and greatly traumatized. Church leaders say the attacks of the Fulani herdsmen on their communities constitute a war “by Islam to eliminate Christianity” in Nigeria,” VOMC said. (With reporting by BosNewsLife’s Stefan J. Bos).